Did you know that the putter is the most important club in your bag. Although a massive amount of attention is given on getting the correct putter shaft length and better heads, the best putter grip plays a very important role in improving your putt. Better putting starts with the best putting grip. A very simple, cheap, and often overlooked way to improve your putting is to replace your putter grip. 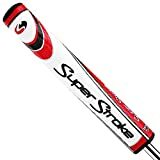 There are different types of putter grips (fat, slim) and you will need to select one based on your personal preferences. The best putter grip should allow you to feel more balanced and comfortable during your putting lessons and more in control when standing over a putt. Below is our look at some of the best available choices on the market. Fat grip putters are becoming very popular with golfers of all abilities. A fat grip putter helps you grip the putter more gently and allows you to change the placement of your hands on the grip, but still maintain control over the club from top to bottom. Odyssey makes the #1 putters in golf with 521 worldwide and 85 PGA tour wins. The Odyssey Jumbo Putter Grip is a masterpiece which is made of a tactile construction material that enhances feel which inspires confidence in the stroke. The semi pistol shape is designed to remove any excess wrist action from your stroke. The putter grip is 10.75″ inch in length and 0.59″ inch in diameter. The grip is easy to install and makes a very tight grip. Is the Fatso 5.0 putter grip a little too fat for you. You might want to check out the Mid Slim grip from Superstroke. The Mid Slim grip is about 1.20″ inch in diameter and 10.50″ inches in length. Like its “fatso” cousin, the Mid Slim technology allows for even pressure in both hands, eliminating added tensions in the wrist and forearms. This definitely helps the arms to swing free, giving you an enhanced pendulum putting stroke. The Excel JumboLite Pistol Putter Grip from Winn offers is made of a special polymer compound that makes it light, comfortable with 65% shock absorption for reduced hand fatigue. The pistol shape slip resistant surface helps keep the angle consistent for a more accurate shot. The weather resistant design helps dissipate water to keep your grips in rough weather conditions. The Super Stroke Slim 3.0 Putter Grip is the most popular model that is used on the tour. This best putter grip is used by pro golfer Jason Dufner. The Slim 3.0 putter grip is about 1.30″ inch in diameter and 10.50″ inches in length. The light-weight foam under listing, and a new high-tech PU material, featuring cross traction technology offers improved fee and tackiness.